So, all this time that I was in my writing Carlsbad Caverns, I accumulated a bit of news. We're seven weeks out from Unearthly's release on January 4th, and it seems like every few days something amazing happens. Reviews are pouring in like crazy on Goodreads, people are pre-ordering the book on Amazon, and all kinds of fun stuff like the completion of the book trailer is happening in the meantime. So keep checking back, because these things are all going to go live very soon. Squee! I love my US cover oodles, but the Aussie cover really took my breath away! Just look at that smoky forest! This past week a few of the big reviewers have run their reviews of Unearthly, and they've all been positive. And Publisher's Weekly also gave Unearthly a STARRED review, which is beyond awesome. To top it off, my author page on HarperTeen went live this week. I've sent my draft for Book 2 to my editor now, which means I'm no longer caught in the tunnel vision of writing all the time--so I can actually pay more attention to all this stuff. I know I've said this before, but it's incredibly surreal. Yesterday I was chatting with fellow debut writer Courtney Allison Moulton, whose book Angelfire is coming out this spring from HarperTeen, and she said, "When are we going to wake up?" I knew exactly what she meant. This feels like the best dream ever. Now to catch up on my emails. . .
WOW! That cover is gorgeous! Congrats on the STARRED review. Unearthly is on my list next - tomorrow I dive in! This cover is sooo sooo beautiful!! I'm happy Publisher's Weekly gave Unearthly such a great Review, but your book is absolutely wonderful. I'm sure it will be a huge success, because your story is captivating and simply beautiful! Unearthly looks amazing! The fact that it's coming out in the UK makes me very happy :). Do you know which publisher you've been signed to in the UK so I can get ready to pre-order? My publisher in the UK is Egmont. The book sounds amazing, I've been reading reviews and I can't wait to read it. I'm going to order it online and I really hope it will be translated into Italian (yeah, I'm Italian), so you'll have plenty of fans here too! Congratulations! That is a beautiful cover. 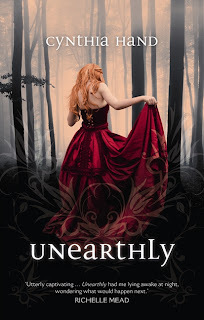 We love Unearthly and we're looking forward to your release day!! OMG!!!! :) I read your book, Unearthly, and I LOVED it!! I'm totally rereading! i loved your first book (unearthly)so i was just wondering when the second book will be out on the shelves? I read Unearthly in under 24 hours. Then went back to the beginning and read it again. Can't wait for the sequel, how long will we have to wait? yes just finished reading unearthly and went straight onto this website to find out when the next one is coming out!! !1 so when is that?????? I know when...Jan 2012. A very long time to wait huh?